The designation of a museum as ‘national’ implies a number of things: status and significance; a settled view of how collections fall within disciplinary boundaries (art, history, science); certain types of relations with visitors as citizens; specific forms of governance and funding structures; and a conceptual affiliation to the civic and the state. Yet the political and epistemic settlement that has underpinned the ‘national museum’ is under pressure on all of these fronts, with significant funding cuts, trans-disciplinary innovations and global flows of people, goods, capital and ideas that transcend national borders. Based in a city that has come to exemplify so many of these processes, this project will deploy ideas of ‘translocality’ ― a concept which foregrounds the connections between people in specific local areas rather than between national states and capital cities ― as a way of re-framing the political geographies of museums. as a concept (to support the development of new readings of inter/national in the context of museums). The National Science and Media Museum was founded as the National Museum for Photography, Film and Television in 1983, at a moment of optimism for Bradford. However, in the 1990s and 2000s different characterizations of the city hardened, the effect of three decades of national media and policy rhetoric which had sought to represent and account for ‘what’s wrong with Bradford’. The National Science and Media Museum has been both affected by, and a player in, these national narratives of Bradford. Since its establishment, the museum has often been cited as a reason to come to Bradford in tourism and business relocation campaigns. Yet the Museum has found a tension in its mission between being locally-engaged and maintaining a high-status role in international photography, film and television peer networks. 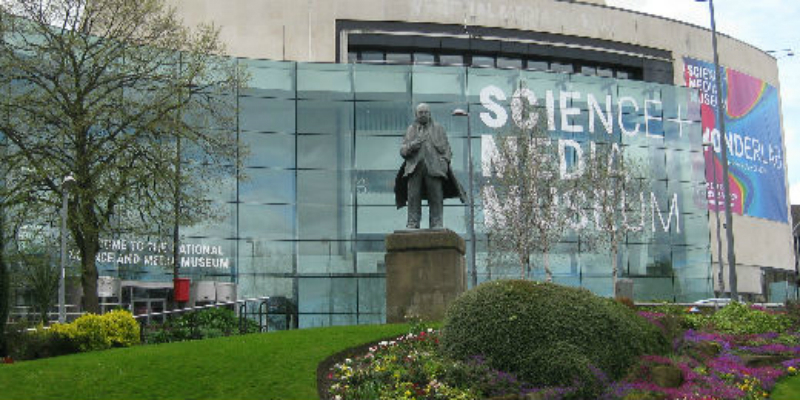 Recent public debates concerning the sustainability of the National Science and Media Museum have made visible a tension between the desire for the status that comes from Bradford having a national museum and an equally strong desire for local accountability. The Bradford’s National Museum project will explore the political geographies of the National Science and Media Museum and wider Science Museum Group, and of the different communities who live in Bradford as a means of addressing the tensions facing inter/national museums in engaging their local audiences. The project will work with the idea of Bradford not as a ‘global city’, but as provincial and connected translocally and place this in dialogue with the National Science and Media Museum’s focus on the ‘science and culture of sound and vision technologies’. The research questions will be addressed through systemic action research allowing us to build a ‘working picture’ of the role the National Science and Media Museum currently plays and use this to identify blocks as well as pathways for productive change. In Phase 1 it will use co-producing translocal stories with people who live locally to ‘Write Bradford into the National Science and Media Museum’. In Phase 2, the project will identify targeted interventions that will ‘Write the National Science and Media Museum into Bradford’, refounding the ‘national’ in the NSMM translocally. In the third and final phase, the project will ensure wider applicability through working with the National Railway Museum and the Museum of Science and Industry (also a part of the Science Museum Group), by building exchanges with other museums internationally ― the Smithsonian Institution (USA) and via Beaconhouse National University (Pakistan) ― and through identifying the implications of the research in a UK context through practitioner and policy-maker workshops. Visit the project website for full information including details of upcoming events.